Werner's Cairns blog: A non-polluting car motor. How often do we yearn for owning a car that would run on anything else than petrol or diesel? The good news is, a friend, Eddie Haring (See Picture) converted an existing car motor that runs on compressed air. Is this perhaps the answer to cleaner and more affordable motoring? When Plato said: “Necessity is the mother of invention”, he certainly didn’t think of exorbitant petrol prices, as the car hadn’t been invented then, but it certainly would apply today and a car motor that runs on air would certainly be a necessity. A personal note. Eddie Haring was born in Germany and is an aircraft engineer (retired). 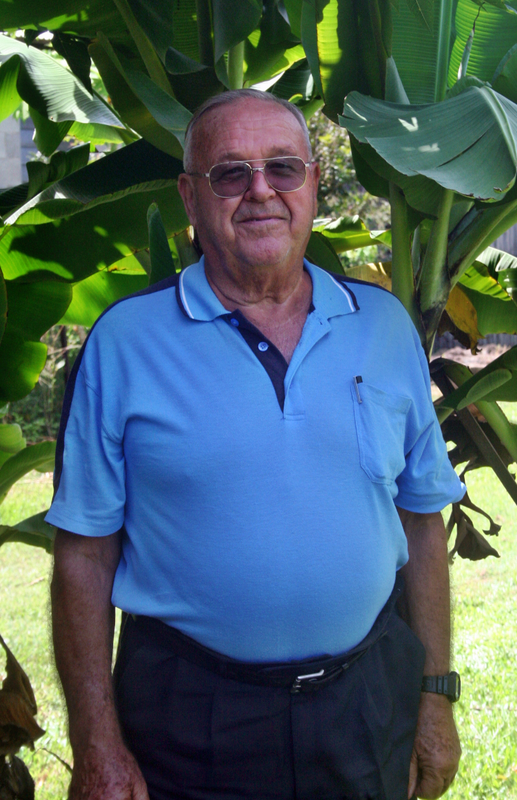 He worked in this capacity in Germany and Papua New Guinea. Eddie also built his own yacht and travelled for 12 years around the world with his lovely wife Ute, and their three children. 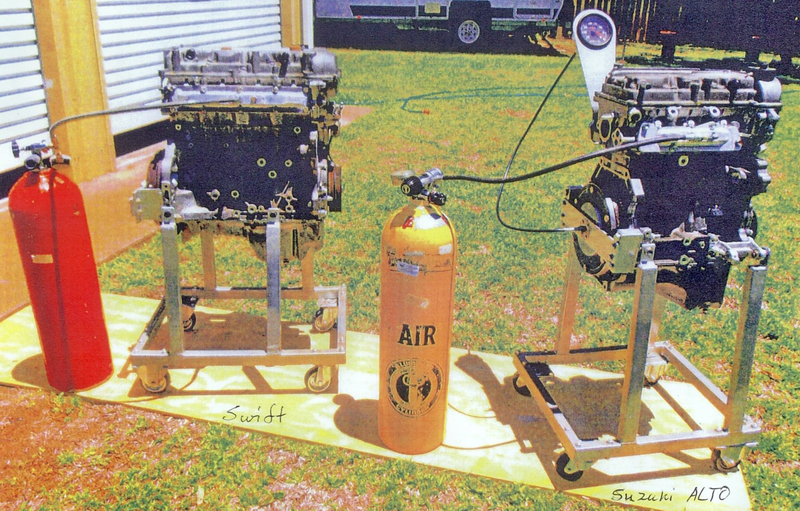 Eddie got 2 Suzuki motor blocks, an “Alto” and a “Swift” and converted them to run on compressed air. (Patented in Australia) Eddie gave me a motor running demonstration of the “Alto engine on a test stand” and I was amazed and very much impressed by what I witnessed. No radiator is needed and no starter motor for the „Alto“. The engine runs very quiet and the exhaust feels cold. This motor is environmentally friendly as clean air goes in and clean air goes out! Air-pollution is avoided! Eddie is hoping that a car manufacturer or somebody takes up this concept and develops it further. And hopefully we will get a car that will run on air, and doesn’t pollute, which would make us independent from oil producing countries. This invention can be applied to any existing car motor! No conventional air-conditioning equipment is needed, or cooling water, or a radiator. Neither is a starter motor required on a 3 cylinder engine. Compressed air will be refilled into lightweight carbon-fibre cylinders by solar panels via an electric driven compressor. Organic farming is improved as farm equipment/tractors/spray machinery does not emit toxic diesel-emissions or fumes! It took many years to develop car-motors as we know them today and equally, air-driven motor development will need time to become a reality and be economically viable. Posted by Werner Schmidlin at 1:33 PM Labels: Air car motor. Wow Werner that is awesome & Eddie you are amazing !!! Wish I lived closer & could afford a conversion !! That is excellent Eddie, this is exactly what we need, it certainly would make life easier. I hope somebody takes it up and develops it further. Thanks Werner for sharing this with us. Wow, that's amazing! Good luck to Eddie. I will send to a few people. Very clever idea, but be careful who you sell it to, Eddie. There are corporate interests who would prefer to trash your invention rather than develop it. It's happened before with other inventions that threatened corporate profits. That is absolutely excellent Eddie what you have done. Just do as the thought of the day says – „Keep scratching!” We certainly need a car motor like this. Not enough said needs a lot more info especially as you are claiming that there is no need for a radiator as all engines produce heat even if it is only friction related. Heat transfer is paramount in bringing about efficiency. With a properly set up internal combustion engine efficiency can be improved through proper heat management and the reward is air fuel ratios above 30:1. Darryl, thanks for your interest.Eddie says that air used from a compressed air bottle is extremely cold and cools the whole engine block. The same cold air will be used for the air-conditioning in the car and is more than efficient.